On September 7th, 2017, the graduation ceremony for the training program on the innovative utilization of bamboo resources in Ecuador’s post-disaster reconstruction was held at the International Centre for Bamboo and Rattan (ICBR). Mr. Hu Yuanhui, Deputy Director General of International Forestry Cooperation Center, Dr. Fei Benhua, Deputy Director General of ICBR, Mr. Claude Lara, Minister at the Ecuadorian Embassy in China, and Mr. Xu Kai, Division Director of the Liaison Office at the Academy for International Business Officials, Ministry of Commerce (MofCom), addressed the ceremony. In his speech, Mr. Hu mentioned that over the past 30 years, China’s forestry development has made visible strides. Forest coverage has risen from 12% in the early 1980s to the current 21.63%, with an overall forest area of 200 million hectares. Multiple FAO reports have recognized the contribution of China’s man-made forests to slowing down the reduction rate of world forest area. China has also been called upon at the UN Forum on Forests to share its valuable experience of forestry development, which China is more than happy to do, as manifest by this very training program. Mr. Hu encourage the participants of this program to apply the knowledge and experience they learnt in China to real practices in their own country so as to promote green development and environmental awareness. In his speech, Dr. Fei talked about the yearly training programs undertaken by the ICBR, which cover a wide range of fields including the cultivation, management, utilization, trade and standard-setting of bamboo and rattan resources as well as the mitigation and prevention of desertification. With the funding from MofCom and State Forestry Administration, ICBR has hosted a total of 33 training programs in the development and utilization of bamboo and rattan resources and desertification-combating since 2005, with 988 government officials and experts from over 80 countries participating, contributing a great deal to the development of bamboo and rattan resources and the prevention of desertification worldwide. He believed that training programs as such provide an excellent platform for bilateral exchanges and a strong impetus to furthering bilateral cooperation. 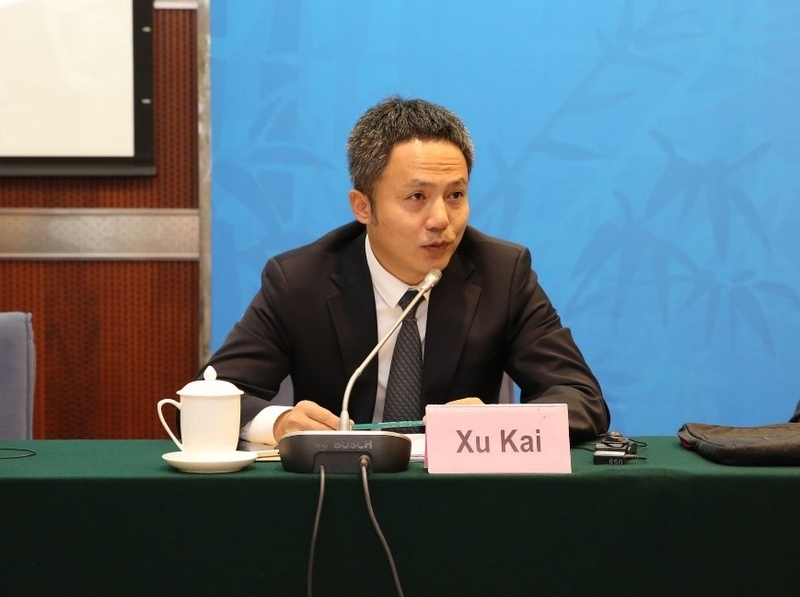 Mr. Xu pointed out that as the largest developing country, China is committed to dialogues with other developing countries to increase mutual trust and enhance cooperation. China is committed to helping other developing countries under the South-South Cooperation Framework. China wish to share our development experience with Ecuador so that the two countries can stand together in the face of challenges and crisis and work together towards a more sustainable, peaceful and prosperous world. China also wish to be a faithful friend to the Ecuadorian people and join hands with them to make more progress. 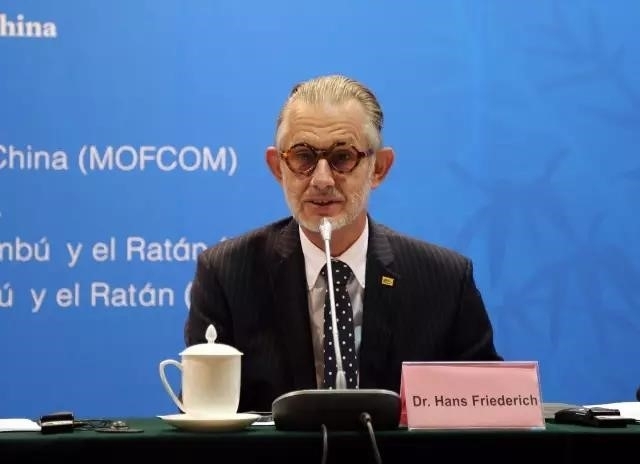 In his speech, Dr. Hans Friederich mentioned that Ecuador became a member state of the International Network for Bamboo and Rattan (INBAR) in 1999, and has since worked closely with the Organization by hosting their Latin America and the Caribbean Area Office. Ecuador is one of the very few countries that include bamboo into their construction standard, a practice INBAR is striving to persuade other countries to follow. INBAR looks forward to working with Ecuador to promote the application of bamboo materials in sustainable construction, restore natural landscape by planting bamboo and improving soil quality and ultimately industrialize the development and utilization of bamboo resources and achieve sustainable development in the rural area. 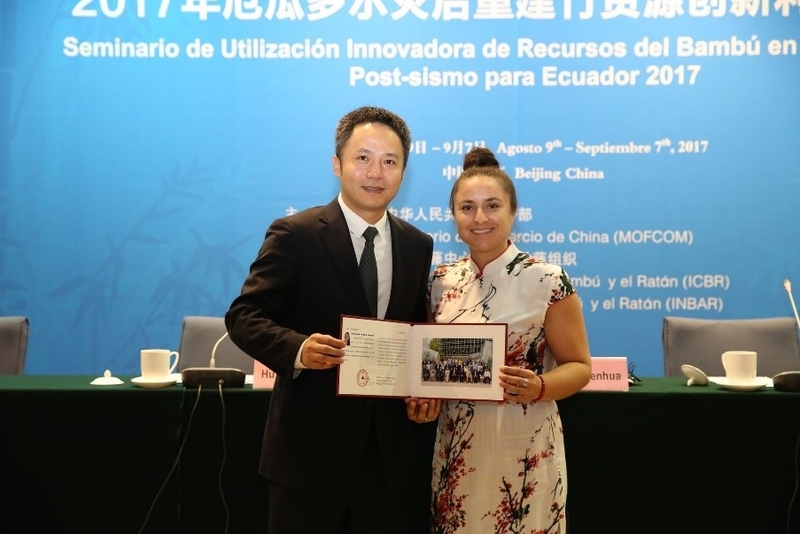 INBAR wishes Ecuador will continue to play the pivotal role in coordinating regional efforts and figure more prominently in setting up bamboo and rattan standards in Latin America as well as the world. INBAR will host the first Bamboo and Rattan Conference (BARC) in June, 2018. We invite Ecuador to attend the conference and join discussions of bamboo and rattan-related development issues such as South-South cooperation, Belt and Road Initiative, climate change response, biodiversity protection and so on. 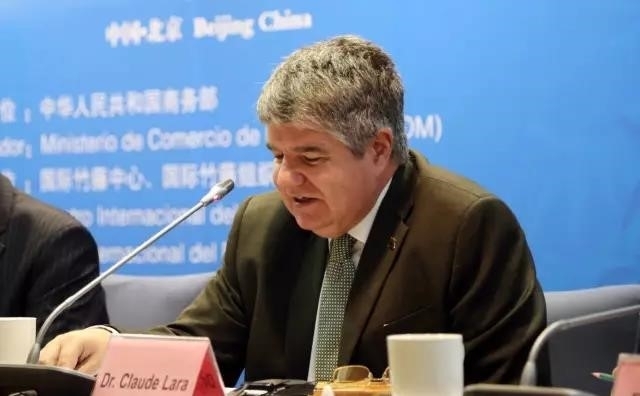 Minister Claude Lara of the Ecuadorian Embassy in China thanked the Chinese government and INBAR for their long-term support and assistance to Ecuador. He commented that this year’s training program has been very helpful to the participants and beneficial to bilateral relationship. Mr. Edgar Calva, Governor of San Domingo de las Tsáchilas, spoke at the ceremony on behalf of all the participants in the program. He thanked the MofCom for funding the program and express gratitude to ICBR and INBAR for designing the courses and providing the best possible conditions for them. He said that they have spent a very happy and fruitful month in China in which they have learnt about the general condition of bamboo resources and industries in China and around the world. They have also had the opportunity to visit man-made bamboo forests and bamboo-processing companies in person, and talked with officials and experts from enterprises, governments and organizations. By doing so, they have familiarized themselves with bamboo cultivation and management skills as well as design and production technologies of bamboo structure and furniture. After returning to Ecuador, they will apply this knowledge to the promotion of bamboo development in their country. 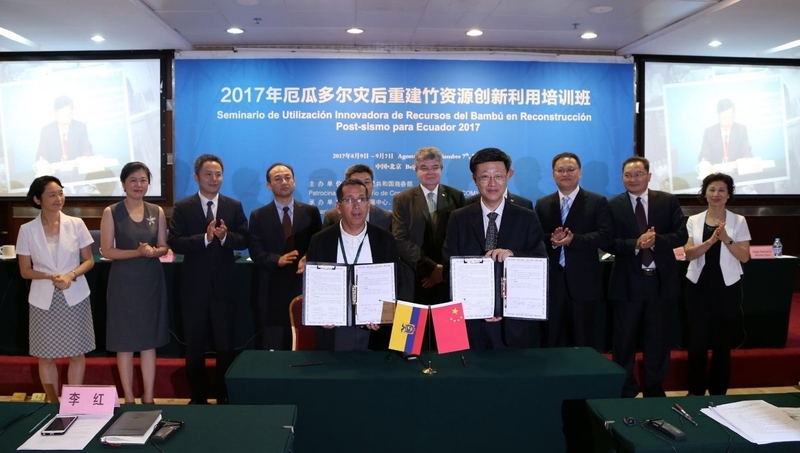 A partnership framework was established between Meishan, Sichuan, China and the provincial government of Santo Domingo de los Tsáchilas, Ecuador. Both parties pledged to set up dialogue mechanisms and forge friendly ties between the two cities. They’ve also agreed to carry out international research and training programs in bamboo technology and promote bilateral trade and investment. This agreement will encourage and facilitate future Sino-Ecuador cooperation. 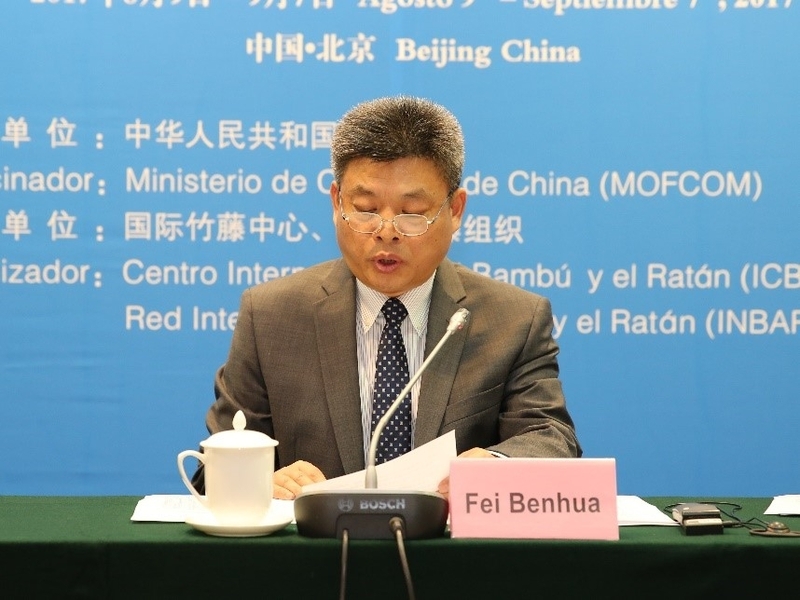 Dr. Fei Benhua addressed the ceremony. Dr. Hans Friederich addressed the ceremony. Dr. Claude Lara addressed the ceremony. Division Director Mr. Xu Kai addresses the Ceremony.